Andrew Cuomo’s unlikely challenger for Governor of New York is gaining endorsements and giving him a headache. 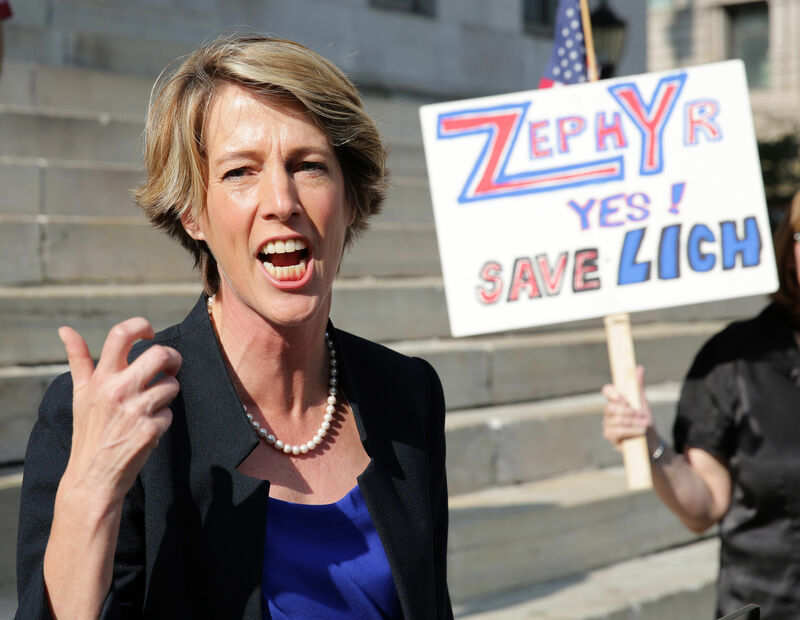 It was a beautiful evening overlooking the Hudson River in Ossining, New York, and Zephyr Teachout was standing on a small wooden stage with the sunset behind her. A law professor at Fordham University who first made her name as the online organizer for Howard Dean’s 2004 presidential campaign, she drew laughter and cheers from the crowd of teachers, anti-fracking activists and public employees who had come out to see her. She was telling them a story about a bull. The audience broke up in laughter, instantly recognizing Teachout’s story as metaphor as much as memoir. The bull, they understood, was meant to be Andrew Cuomo, the powerful incumbent governor—and son of another powerful governor, Mario Cuomo—who is known for his strong-arm tactics and relentless pursuit of his political goals (including a potential run for president in 2016). The child, of course, was meant to be Teachout, the unlikely primary challenger, who manages to outmaneuver her foe using swiftness and wit. With the September 9 Democratic primary just a few weeks, Teachout has been doing her best to agitate the bull by calling out Cuomo for what many see as his betrayal of basic Democratic principles in favor of stock Republican positions: his attacks on organized labor, his support for charter schools and high-stakes testing, and his penchant for cutting taxes for the rich while cutting services for the poor, to name a few. Embracing a brand of populism that stands in sharp contrast to Cuomo, Teachout has framed these differences as more than a series of policy quibbles. They are, in her formulation, a decisive choice between organizing political principles: between the corruption of private, insider power and the equality that can prevail through true democratic processes. Until a few weeks ago, these efforts seemed destined for well-meaning obscurity, with Teachout’s candidacy serving, above all, as an opportunity to cast a principled protest vote. With little fundraising muscle or institutional support—the establishment has lined up behind the governor—Teachout and her running mate, Tim Wu, were (and still are) the clear underdogs. But the last few weeks have shaken up the landscape in ways that shift both the significance and, potentially, the prospects of Teachout’s campaign. As she and Wu have traveled parts of the state, they have managed to tap into some of the profound frustration that people feel with a governor who has come to symbolize the corporate-friendly wing of the Democratic party. But they have also, and perhaps far more significantly, emerged as the anti-corruption crusaders running against a candidate who has been been hit, mid-campaign, by a bruising ethics scandal. This scandal centers on a commission Cuomo created in 2013 to investigate public corruption and then disbanded months later because its members began to look too closely at some of his friends and donors. Such campaign-season scandals are hardly new, but the fact Teachout is about to publish a book about just this type of political corruption—Corruption in America: From Benjamin Franklin’s Snuff Box to Citizens United—and is considered a leading scholar of corruption has injected her campaign with a powerful sense of relevancy. Of all candidates, few have formulated as robust a critique of today’s politics of corruption as Teachout. Others, however, like Jake Jacobs, who teaches art in the Bronx, came out to hear other speakers and found themselves swayed by Teachout. “It’s great when people ask questions of the audience and the audience participates, that’s a teacher,” Jacobs said. Populism has become something of a buzzword in American politics in the last couple of years—a term that has been applied to Massachusetts Senator Elizabeth Warren, New York City mayor Bill de Blasio and just about anyone who has incorporated the term “inequality” into a campaign stump speech. Populism is an old American tradition that dates, as Michael Kazin points out in his book The Populist Persuasion, back before the People’s Party, or Populists, was founded in 1891. The People’s Party, a third party of farmers and laborers, itself rose out of the conviction that the two major parties, the Democrats and Republicans, were controlled by bankers and elites. Teachout and Wu have been working hard to channel that energy in New York State. They’re calling for a higher minimum wage, a rollback of Cuomo’s tax cuts for the wealthy, an investment in infrastructure from public transportation to the Internet, and a ban on hydrofracking. On education, they call for a halt to high-stakes testing and for equitable funding in both poor and wealthy school districts; they support returning the right to vote to convicted felons and granting driver’s licenses and tuition assistance for undocumented immigrants. Perhaps most important in this election cycle, when corruption is center stage, they are calling for public financing of elections to cut back the power of wealthy insiders and corporate donors. There is a third party in New York State that supports most of these principles—the Working Families Party, a labor-backed party that takes advantage of New York’s “fusion” voting laws to endorse progressive Democrats that meet their criteria. It was the Working Families Party that first recruited Teachout, last March, as a possible candidate on their ballot line for November’s general election, against Cuomo. But after Cuomo came to the table and agreed to support some of the WFP’s key proposals (like supporting a Democratic takeover of the State Senate this fall), 58.7 percent of the WFP state committee voted to endorse Cuomo, while 41.3 percent backed Teachout. That means that Cuomo will appear on their ballot line as well as the Democratic party line this fall. After the WFP about-face, Teachout might easily have bowed out and returned to her life as an activist and professor. But having decided to get into the race, Teachout moved instead to challenge the governor in the Democratic primary. She asked Wu to join her ticket, garnered 45,000 petition signatures to secure her spot on the ballot and successfully defended a legal challenge from Cuomo that attempted to kick her off the ballot. Yet there is little language around such a platform, she noted, even among the Democratic party’s biggest so-called populists. That’s why she was drawn to Wu, who coined the term “net neutrality” and has focused his work on telecommunications monopolies, and that’s why her campaign speeches have quite a few echoes of the old People’s Party, references to “twenty-first-century” technology notwithstanding. Teachout is not a radical at heart. “I’m a down-the-line Democrat,” she said onstage, and has repeated it in interviews. Unlike Howie Hawkins and Brian Jones, the Green Party’s candidates for governor and lieutenant governor, or Kshama Sawant, who won election as a socialist to Seattle’s City Council, Teachout doesn’t boldly trumpet socialist policy. Yet it’s still amazing how radical a simple populist Democrat sounds. There’s a lot of that kind of independent hustle about her current campaign as well. I rode the MetroNorth to Ossining with Teachout and two campaign volunteers for the education rally, while she made call after call to the press and was greeted by at least one commuter who recognized her and wished her good luck. She’s undeniably the underdog in this race, with a budget in the hundreds of thousands compared to Cuomo’s millions, and she’s OK with that. At the same time, though, she said, “[Cuomo] has everything to lose and I’ve got nothing to lose.” It’s good, she said, to be the underdog, because someone like Cuomo can overplay his hand. The best argument for Teachout’s continued run has been the last few weeks of headlines about Cuomo. The Moreland Commission to Investigate Public Corruption, which Cuomo formed in July 2013 and then killed last March, has drawn an investigation from a federal prosecutor into whether the governor illegally attempted to influence the commission’s findings. A blockbuster report from The New York Times has been followed by smaller stories that, among other things, highlight the governor’s outrage at being investigated and opened up a space for a progressive challenger to speak. “The fact that Cuomo could be indicted…is an example of the problem we’re dealing with,” Whitney added. On the train home from Ossining, Teachout said that long before the Moreland Commission was shut down, she told people that she thought it had taken on a life of its own, that it had become something even the governor couldn’t control. That same feeling is one she has now about the campaign. I asked her what it would say to national political watchers if she managed to win an expected low-turnout primary. “That you cannot forget the Democrats that are in your state,” she said.